Macarons are heavenly little discs of almond meringue stuck together with butter, fruit or chocolate based fillings. I was lucky enough to attend classes at Le Calabash cooking school in France where Alison Bond (an amazing pastry chef) showed how to make a variety of macarons. Initially, I was not looking forward to this particular lesson as I mistakenly confused macarons with macaroons (chocolaty globs of coconut that my mother loved). I am glad I was wrong on that one! Last year I made some delicious Vietnamese chocolate beignets filled with a dark chocolate pink peppercorn truffle filling and wanted to see if I could recreate those flavours using the Le Calabash macarons as a base. The modified recipe appears below. The chocolate ganache was made first. Pink peppercorns are finely ground. Chocolate is weighed out and placed into a bowl. Ground pepper, honey and heavy cream are boiled and poured over the chocolate. The pepper is adjusted to taste and the chocolate placed into a pastry bag after cooling. Ground almonds, icing sugar egg whites and cocoa are folded together with Italian meringue. The mixture is then folded/pressed with the spatula until is is the right consistency (this is called ‘macaronage’). 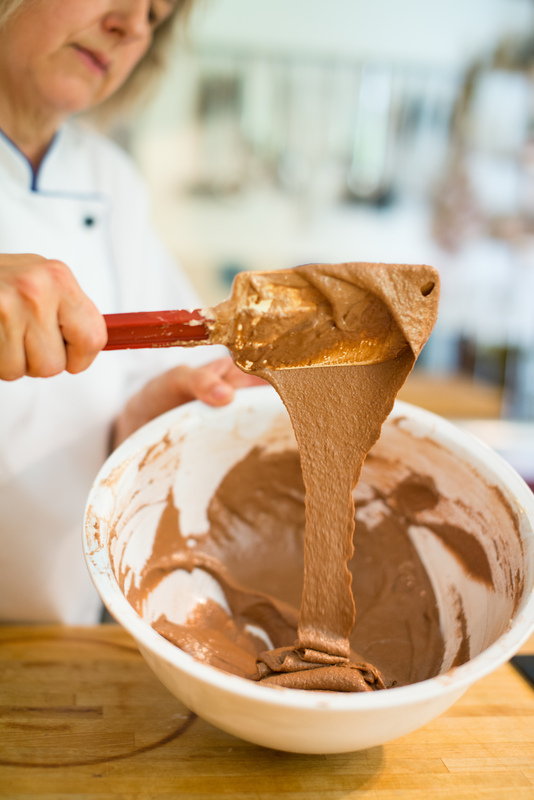 The batter should be glossy and form ribbons when poured. The mixture is put in a pastry bag. The batter is piped into small circles. I used parchment paper (that I drew circles on) in the past but it would wrinkle and some of the macarons would have an odd shape. This time I used a silicon mat from DeBuyer and it was a huge improvement. The shells are baked, filled and enjoyed. The original version of this recipe (without the pepper) has a wonderful bold chocolate flavour. The pink peppercorn was a good addition to the chocolate but next time I think I will try to slightly tone down the chocolate intensity by using a mixture of dark and milk chocolate. Prepare your mise en place. (Measure out all of your ingredients and prepare your work space). Heat cream, honey and ground peppercorns in a pot. (It may be wise to go a little light on the pepper – you can add more later). Remove from heat, cover and let infuse for 30 minutes. Reheat the cream mixture until boiling and pour over chopped chocolate pieces. Mix until smooth. When cool enough to sample, adjust seasoning to taste. Place in refrigerator to set. Transfer mixture into a pastry bag when cool. 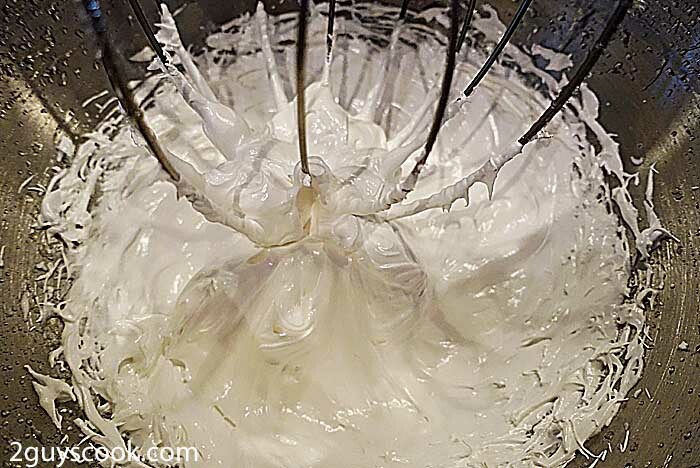 Combine sugar and water to 118 C.
Carefully pour hot sugar mixture into egg whites while beating. Allow the meringue to cool to 50 C (with mixer still running). Add meringue to the bowl with the almond/sugar mixture and fold together. Perform macaronage – press spatula against bottom of bowl using small round movements (to compress mixture). Continue until the mixture is glossy and forms ribbons when poured. Put batter into a piping bag with a 6, 7 or 8 pastry tip. 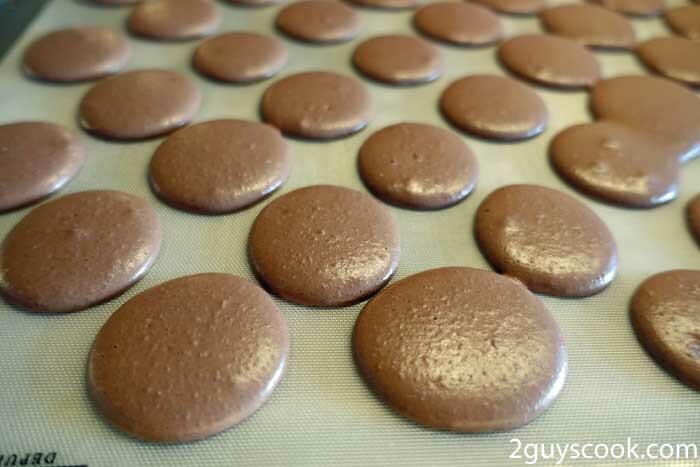 Pipe batter into small circles (~3.5 cm) onto prepared parchment or silicon sheet. The batter will spread so leave adequate room between them. Leave sit for at least 30 minutes. The surface should dry out a little and not stick to your finger when touched. (This step allows the feet, the little ridge at the bottom of the shell to form). Put into 180 C preheated oven for 12 minutes. Open oven door for a few seconds at 8 and 10 minutes to let any steam out. Remove from oven and let cool before removing from the trays. 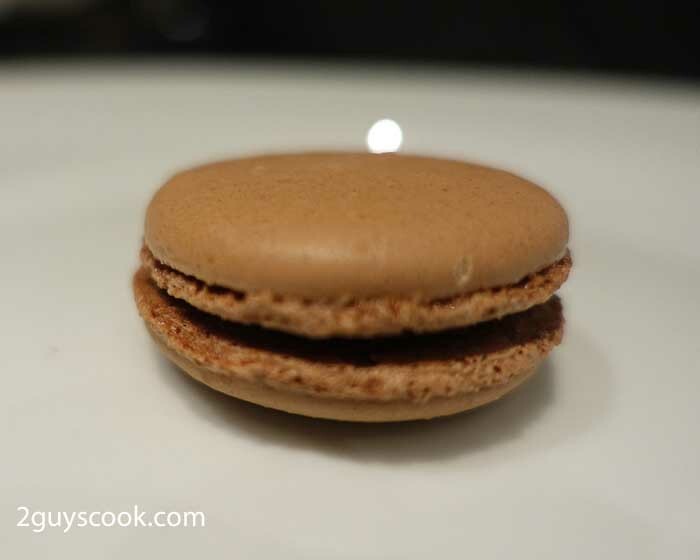 Match like sized shells up to form the top and bottom of your macaron. Pipe ganache filling onto the bottom pieces and gently press/rotate the top into place. Place in refrigerator and leave for 24 hours before eating.